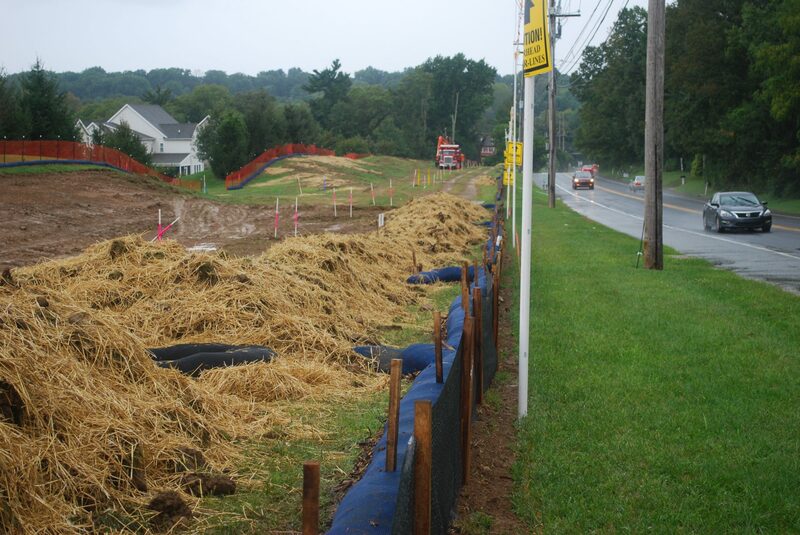 An easement where Sunoco Pipeline is preparing for construction of the Mariner East 2 pipeline. A homeowners group is asking a court to halt construction in that location until Sunoco comes up with a plan to mitigate contaminated soil on the site. A sign marks the path of the Mariner East 1 pipeline through Chester County. The Mariner East 2 pipeline received its permits from the Pennsylvania Department of Environmental Protection in February 2017, after the company failed several attempts to produce completed applications and was repeatedly sent back to the drawing board by DEP. Critics said the permits issued by the administration did not meet standards set by the DEP. The construction along the 350-mile pipeline that would carry natural gas liquids has since been plagued with problems, including dozens of drilling mud spills. In one case the construction ruined an aquifer in a Chester County community. The pipeline project also resulted in 552,000 gallons of bentonite mud spilled into LeTort Spring Run, an Exceptional Value wetland in Cumberland County. Bentonite is non-toxic, but in large amounts can smother aquatic life. Sunoco, DEP and several environmental organizations agreed to a settlement in July, approved by Judge Bernard Labuskes of the Environmental Hearing Board. Drilling resumed in August after Sunoco agreed to a series of water-protection measures including stronger oversight by the DEP. But official data and local reports indicate that water issues have continued in some locations. Meehan said he was encouraged by the negotiated settlement, but notes the EHB’s order has not stopped the contamination. “Constituents remain worried about this process following recent reports of undisclosed leaks of drilling fluid and unauthorized methods of drilling,” he wrote. Meehan said a risk assessment would look at the hazards associated with the pipeline’s operation, including natural gas liquid leaks, which could lead to explosions. The pipeline is scheduled to be operational in 2018. A spokesman for Gov. Wolf says he would support a risk assessment, but it’s up to the Pennsylvania Public Utility Commission to conduct one. A spokesman for the Pennsylvania Public Utility Commission says the commissioners are reviewing Congressman Meehan’s request. Eric Friedman, who lives along the pipeline route and is president of the Andover Homeowners Association and a member of the Middletown Community Coalition for Public Safety, which has been pushing for a risk assessment, praised Meehan’s letter. This story has been corrected to show that the Mariner East 2 pipeline received permits from the Department of Environmental Protection in February 2017, not 2016.